The D-Link DSM-210 Internet Frame really is best of breed. Besides displaying images from various places on my network, or from its built in 1 gig memory, it does a really great job of displaying RSS feed snippets from blogs and such. Or weather reports, or images emailed to my online frame account from invited friends. 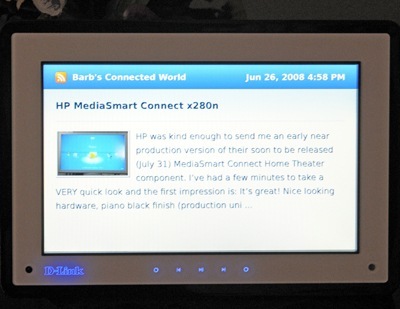 There’s lots of content available from http://dlink.framechannel.com/ that can be displayed on the frame. Including the ability to view shared photo streams from flickr, facebook, webshots, photobucket, and more. 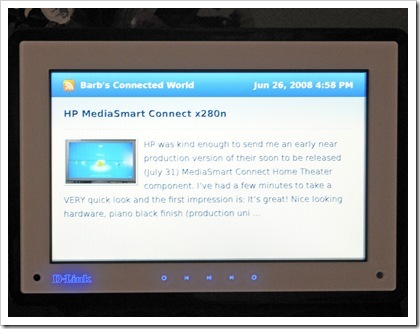 MSNBC had a write up of Frame Media, which provides the online service for D-Link and several other companies. As much as I liked the Momento frame that I’ve had for a couple of years, it had a few shortcomings. It didn’t support WPA2 (only WPA) and the remote was a little flaky requiring multiple keypresses at times to enter a character at times. And it did not see my mixed g/n networks (and couldn’t connect to them even if I entered the SSID and credentials manually). There haven’t been any firmware updates, and the Momento frame really isn’t readily available. It is important to note that the Momento I had here was pre-production, from the floor of CES. The DSM-210, however, implements WPA2, sees all available networks, and the mini remote is extremely responsive. The frame goes into standby mode at night when I turn off the lights in my living room and starts up again in the morning when I enter the room. D-Link tells me that the frame will be available soon online and in the usual big box stores.